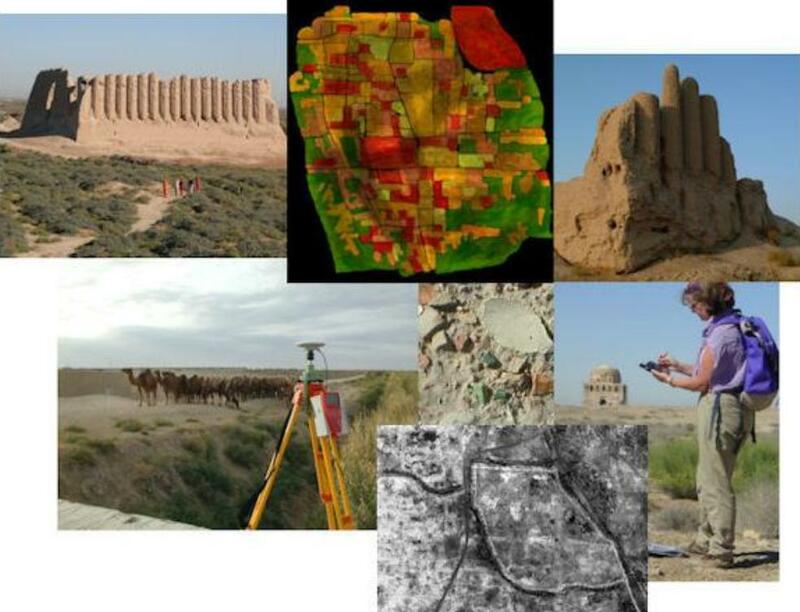 Merv is the city which in medieval times dominated the province of Khurasan in today's Turkmenistan. Early Islamic geographers recorded a great economy based upon thriving farming and irrigation: a highly organized system of maintenance, a system of irrigation canals and a dam above the city with the supply of water regulated and measured by a metering device. Under the Abbasids, Merv continued to be the capital of the East. The great prosperity of Merv belongs to the period of 8th to the 13th century. In the latter half of the 10th century, when the geographer Al-Muqaddasi knew Merv, a third part of the suburbs was already in ruins, and the citadel was in no better state; however, in the next century, the citadel gained in size and importance under the Seljuks. By the 11th century, Merv was a great commercial centre of the Oriental type with a bazaar, traversed by two main streets, the centre of the market roofed by a dome, shops for artisans, money changers, goldsmiths, weavers, coppersmiths, and potters. It was an administrative and religious centre, containing mosques, madrasas, palaces, and other buildings. The dome of the mausoleum of Sultan Sanjar, one such place, was of turquoise blue, and could be seen at a distance of a day's journey away. One of Merv trademarks was its textile products, silk produced in abundance, and also a school for its study. The region was also famed for its fine cotton and exports, of raw products and manufactured, sent to different lands. Merv was one of the great emporia of the caravan routes between western and eastern Asia, including to China. This meant that gradually trade and urban activities became the source of wealth rather than agriculture. Yaqut al-Hamawi, the famous geographer (d. 1229), spent two years studying in the many libraries of Merv which he admired. According to him, there were ten wealthy libraries in the city around 1216-1218, two in the chief mosque and the remainder in the madrasas. Yaqut was in Merv, collecting the materials for his great geographical dictionary, for before the Mongol invasion the libraries of Merv were celebrated. "Verily but for the Mongols I would have stayed and lived and died there", he writes, "and hardly could I tear myself away". Among others, he mentions the two libraries of the Friday mosque, namely the Aziziyah with 12,000 or so volumes, and the Kamaliyah. There was also the library of Sharaf al-Mulk, in his madrasa, and that of the great Seljuk vizier, Nizam al-Mulk. Among the older libraries were those founded by the Samanids, and one in the college of the Umaydiyah; also that in the Khatuniyah College and that which had belonged to Majd al-Muluk. Figure 5: Exert from the beginning of the edition and translation of Kitab Mizan al-Hikma by Nicholai Khanikoff: "Analysis and Extracts of Kitab Mizan al-Hikma, an Arabic Work on the Water-balance, written by al-Khazini in the Twelfth Century. By the Chevalier N. Khanikoff, Russian Consul-general at Tabriz, Persia." Journal of the American Oriental Society vol. 6 (1860): pp. 1-128. Merv produced one of the earliest and greatest scientists of Islam, Ahmad ibn 'Abdallah al-Marwazi (Marwazi means from Merv) best known as Habash al-Hasib (the calculator), who flourished in Bagdad and died between 864 and 874. He was an astronomer under the Caliphs al-Mamun and al-Muttasim. Habash made observations from 825 to 835 and completed three astronomical tables, the best known being the mumtahin (tested) tables, which may be a collective work of al-Ma'mun's astronomers, for there was a whole team involved in observation at the court at the time. Apropos of the solar eclipse of 829, Habash gives us the first instance of a determination of time by an altitude (in this case, of the sun); a method which was generally adopted by Muslim astronomers. He seems to have introduced the notion of "shadow," umbra (versa), equivalent to our tangent, and he compiled a table of such shadows which seems to be the earliest of its kind. One of Habash's son, called Djafar was also a distinguished astronomer and instrument maker. A lesser known scholar also from Merv is Al-Saghani, who was a mathematician and astronomer attached to the Buyid observatory in Baghdad. In mathematics, he followed up the work of the Banu Musa, tackling the problem of trisecting the angle, which had preoccupied the ancient Greeks. He was particularly versed in mechanics, and constructed, if he did not invent, the instruments he used for his astronomical observations. (4) Al-risala al- maghribiya (the Magribi treatise). The last two works have not survived. (3) chronology or eras (tawarikh), conjunctions (qiranat), chiefly of Saturn and Jupiter, periods of revolution (adwar)—for example, dawr al-qiran or 'awd al-qiran (return of the conjunction). The Tabsira is shorter and covers essentially the same ground; however, it does not contain the elaborate description of the five seas which forms the second chapter of the second part of the Muntaha. Al-Kharaqi developed the theory according to which the planets are not supported by imaginary circles, but by massive revolving spheres. That theory had been previously expounded by al-Khazin (not to be confounded with al-Khazini), and it found its way into Western Europe through Hebrew and Latin translations of Ibn al-Haytham's treatise Fi hay'at al-'alam. Another scholar to come from Merv was a historian, his name al-Tamimi al-Sam'ani (that is, of the tribe of Sam'an, a branch of the tribe of Tamim), Taj al-Islam. He was born in Merv in 1113, travelled extensively in Eastern Islam and died in Merv in 1166. He continued the annals of Baghdad begun by al-Khatib (second half of the 11th century). In 1155, he undertook an extensive study of Arabic patronymics (nisba) in eight volumes, which is of great historical geographical interest. Apropos of the names of prominent persons he supplies biographical and topographical explanations, which had been collected by him in the course of his journeys, during which he had met for that very purpose a large number of learned men. His work called Kitab al-ansab is particularly valuable with regard to Persia, Transoxiana, and Central Asia, for which countries it is our principal and often only source of information. The Kitab al-ansab is better known through an abridgment of it, the Lubab, compiled by the renowned historian Ibn al-Athir; or through a further abridgment, the Lubb al-lubab, by al-Suyuti. There is no complete edition of the Ansab, unfortunately, and traces of the work had to be found in Ibn al-Athir and al-Suyuti (second half of the 15th century). There are extracts and details in German on both author and his work by Wüstenfeld. Possibly, the greatest of all scholars to come from Merv was al-Khazini. Abderahman al-Khazini flourished ca. 1115-ca 1130 at Merv. Of his life very little is known. A slave (and later a freedman) of Byzantine origin, he was bought by a treasurer (khazin) of the Seljuk court at Merv, called Abu’l-Husayn (or Abu’l-Hasan) Ali ibn Muhammad al-Khazin al- Marwazi, who gave him a good scientific education. Al Khazini subsequently became a mathematical practitioner under the patronage of the Seljuk court. He was very much an ascetic, refusing rewards and handed back 1000 Dinars sent to him by the wife of an Emir. He lived on 3 dinars a year. His accomplishments in astronomy include his description of his construction of a 24-hour water clock designed for astronomical purposes and for his treatise Al-Zij al-Mu'tabar al-Sinjari (The esteemed Sinjaric tables), giving the positions of the stars for the year 1115/16 at the latitude of Merv. He is also credited with a careful determination of the obliquity of the ecliptic (the band of the zodiac through which the sun apparently moves in its yearly course), but, as Samso remarks, he adopts Al Battani’s value of 23°35′ and concludes (against al-Battani and most of the successive Islamic astronomical tradition) that this parameter is a constant. Al-Khazini is, however, better known for his book Kitab Mizan al-Hikma (The Book of the Balance of Wisdom), completed in 1121. This encyclopaedic treatise has remained a centrepiece of Muslim physics. Kitab Mizan al-Hikma was written for Sultan Sanjar's treasury by Al-Khazini, and has survived in four manuscripts, of which three are independent. It studies the hydrostatic balance, its construction and uses and the theories of statics and hydrostatics that lie behind it and other topics. It was partly translated and edited by the Russian envoy Khanikoff in the mid-19th century. It is important to mention that the first of its eight chapters deal with the theories of centres of gravity, specific gravity and the steelyard theory of his predecessors' including al-Biruni, Al-Razi, 'Umar al-Khayam, Thabit ibn Qurra, al Isfizari, and the Greek authors Archimedes and Euclid. Al-Khazini most particularly draws attention to the Greeks' failure to differentiate clearly between force, mass and weight, and shows awareness of the weight of the air, and of its decrease in density with altitude. By looking at his predecessors' scientific legacy, al-Khazini provides crucial records of their contributions that could have remained unknown or lost. A significant part of the book is devoted to hydrostatics, most particularly the determination of specific gravities. Al-Khazini goes to extreme length in describing the equipment necessary to obtain accurate results. His scrupulousness in the preparation of his equipment and materials and in carrying out varied applications of his balances make his book one of the best examples "of rigorous attention to scientific accuracy." His interest is devoted to the determination of the specific gravities of metals, precious stones and alloys with commercial purposes in mind, so as to determine the purity of various substances and to detect fraud. To determine the specific weight of a specimen, its weight has to be known in air and water, and the volume of air and water displaced by the specimen. Hence, most Muslim researchers used water balances in their experiments. Using the same instrument as al-Biruni, Al-Khazini made repeated trials with several metals and gemstones. He also measured the specific gravities of other substances such as salt, amber and clay, noting whether the substance sank or floated on water. In all, he records the specific gravities of fifty substances that include precious stones, metals and liquids. The accuracy of such measures is impressive and is offered by Hill, together with modern values. Mieli sees the determination of specific weights by al-Biruni and al-Khazini as some of the most outstanding results obtained by the Muslims in experimental physics. Figure 9: Diagram of the balance of wisdom drawn by H. Bauereiss in his dissertation under the direction of E. Wiedeman: Zur Geschichte des spezifischen Gewichtes im Altertum und Mittelalter. Erlangen, 1914, p. 31. Al-Khazini was, thus, the first to propose the hypothesis that the gravities of bodies vary depending on their distances from the centre of the earth; this phenomenon was only discovered in the 18th century (six centuries after al-Khazini) after a certain development in the theory of gravitation. Al-Khazini also found that there was greater density of water when nearer to the centre of the earth more than a century before Roger Bacon (1220-1294) propounded and proved the same hypothesis. Figure 10: Line drawing of the balance of wisdom or Al-Mizan al-Jami' (the universal balance) of al-Khazini as it was drawn by the publishers of Kitab Mizan al-Hikma in Hyderabad in 1358H/1940, p. 130. Figure 11: Page from the Persian translation of Kitab Mizan al-Hikma. The Muslims who were already facing the Crusades (1095-1291), suffered further invasions form the east, which devastated their eastern empire. In 1219-1222, Genghis Khan and his hordes flattened the eastern parts of the Muslim land. In just one year the Mongols seized the most populous, the most beautiful, and the best cultivated part of the earth whose inhabitants excelled in character and urbanism; and inflicted all ills on them. An army under Genghis' son Jagtai, captured and sacked Otrar, whilst another under Genghis himself, burned Bukhara to the ground, raped thousands of women, and massacred 30,000 men. Samarkand and Balkh surrendered but suffered pillage, and wholesale slaughter; so much so that a century later Ibn Battuta (14th century) described these cities as still largely in ruins. Through Khurasan, the Mongols ravaged every town on their march, placing captives in their vanguard, giving them the choice between fighting their fellow men in front or being cut down from behind. Amidst the toll of destruction was that of al-Jurjaniyah dam south of the Aral Sea, which diverted the River Oxus from its course and deprived the Aral Sea of water, causing it to nearly dry out centuries later. When Merv was visited in the 14th century by Ibn Battuta, it was still in great ruin. Mustawli also saw that it was still largely in ruins, and the sands had begun encroaching. Hafiz Abru adds that the Mongols had broken down all the great dams and dykes, which under the Seljuks had grown in number, and been carefully maintained, in order thus to regulate the irrigation of the oasis; now everything had lapsed into a desert swamp. First and foremost, their claim is a fallacy, for most places taken by the Mongols offered no resistance whatsoever (see D’Ohsson, for instance). Secondly it is a contradiction to say that only those who fought were slain and then to state that all the inhabitants, including women and children, were slaughtered. Figure 12-13: Two views of the balance of wisdom as reconstructed by H. Bauereiss and F. Keller (1908-1911), rediscovered by M. Abattouy and Professor Jürgen Renn (director of the Max Planck Institute for the History of Science, Berlin) in the Deutsches Museum in Munich in 2002 (item invent. Nr. 31116). © Max Planck Institut für Wissenschaftgeschichte, 2002. See Mohammed Abattouy,Muslim Heritage in Mechanics and Technology: Outline of a Program for Future Research. Ibn al-Athir: Kitab al-kamil; ed. K.J. Tornberg; 12 vols., Leiden; 1851-72. Ibn Battuta: Voyages d'Ibn Battuta, Arabic text accompanied by French translation by C. Defremery and B.R. Sanguinetti, preface and notes by Vincent Monteil, I-IV, Paris, 1968, reprint of the 1854 edition. Ibn Battuta: Travels in Asia and Africa; translated and selected by H.A.R. Gibb; George Routledge and Sons Ltd; London, 1929. C. E. Bosworth: "Merv"; Encyclopaedia of Islam; New Series; vol. 6; pp. 618-21. J.L.E. Dreyer: A History of Astronomy from Thales to Kepler; Dover Publications Inc, New York, 1953. W. Durant: The Age of Faith, Simon and Shuster, New York; 6th printing; 1950. R.E. Hall: "Al-Khazini", in Dictionary of Scientific Biography; vol. VII, 1973: 335-51. D.R. Hill: Islamic Science and Engineering; Edinburgh University Press; 1993. Al-Khazini: Kitab Mizan al-Hikma, Hyderabad; partial English translation by N. Khanikoff (1860); "Analysis and extracts of Kitab mizan al-Hikma (book of balance of Wisdom), an Arabic work on the water balances, written by al-Khazini in the twelfth century,' Journal of the American Oriental Society 6:1-128; also Russian translation: by M.M. Rozhanskaya and I.S. Levinova, Al-Khazini. Kniga vesov midrosti,' Nauchnoye nasledstvo, Moscow, vol 6, 1983; pp 15-140. G. Le Strange: The Lands of the Eastern Caliphate; Cambridge University Press; 1930. A. Mieli: La Science Arabe et son rôle dans l'évolution mondiale, Leiden, E, J. Brill, 1966. M. Meyerhof: "Science and Medicine", in The Legacy of Islam; edited by Sir T Arnold, and A. Guillaume; Oxford University Press; 1931. Baron G. d’Ohsson: Histoire des Mongols: 4 vols, La Haye et Amsterdam; 1834. J. Pedersen; The Arabic Book (1928) translated by Geoffrey French; Princeton University Press; Princeton, New Jersey (1984). J. Samso: Al Khazini; in H. Selin Edition: Encyclopaedia of the History of Science, Technology, and Medicine in Non Western Cultures, Kluwer Academic Publishers. Boston/London, 1997; p. 135. G. Sarton: Introduction to the History of Science; The Carnegie Institution; Washington; 1927 ff. J.J. Saunders: The History of the Mongol Conquests; Routlege & Kegan Paul; London; 1971. C. Schoy: Liber den Gnomonschatten und die Schattentafel; Hanover, 1923. R.B. Sergeant: Islamic textiles up to the Mongol Conquest; Beirut 1972. N. Smith: A History of Dams, The Chaucer Press, London, 1971. B. Spuler: History of the Mongols; London, Routledge & Kegan Paul, 1972, p.31. H. Suter: Die Mathematiker und Astronomer der Araber; 1900. J. W. G. Wiet et al. : History of mankind; Vol. III: The Great Medieval Civilisations. Part Two: section two; Part three; Translated from the French. UNESCO; 1975. C. E. Bosworth: Merv; Encyclopaedia of Islam; New Series; vol. 6; pp. 618-21; at p. 618. G. Le Strange: The Lands of the Eastern Caliphate; Cambridge University Press; 1930; pp. 401 ff. C. E. Bosworth: Merv; p. 619. For Merv topography, see G. Le Strange: Lands; op cit. ; pp. 397-403. R.B. Sergeant: Islamic textiles up to the Mongol Conquest; Beirut 1972; pp. 87-90. C. E. Bosworth: Merv; op cit. ; p. 619. Yaqut al-Hamawi in J. Pedersen; The Arabic Book, New Jersey (1984), p. 128. G. Le Strange: The Lands; op cit. ; p. 401. G. Sarton: Introduction to the History of Science; The Carnegie Institution; Washington; 1927 ff. ; vol. I; p. 565. For more on Habbash and his accomplishments, consult: H. Suter: Die Mathematiker und Astronomer der Araber; 1900; pp. 12, 27; J.L.E. Dreyer: A History of Astronomy from Thales to Kepler; Dover Publications Inc., New York, 1953; C. Schoy: Liber den Gnomonschatten und die Schattentafel; Hanover, 1923. G. Wiet; V. Elisseeff; P. Wolff; and J. Naudu: History of Mankind; Vol 3: The Great Medieval Civilisations; Translated from the French; George Allen & Unwin Ltd; UNESCO; 1975; p. 647. G. Sarton: Introduction; op cit. ; vol. ii; pp. 204-5. By C. A. Nallino: Albatenii opus astronomicum; vol. 1, 169-175, Milan. E Wiedemann: Beitrage zur Geschichte der Naturwissenschaften, 20; Sitaungsber. der phys. med. Sozietat sur Erlang vol. 42, 72, 1910. G. Sarton: Introduction; op cit. ; II; pp. 444-5. F. Wustenfeld: Geschichtschreiber der Araber; no. 54, P. 87, 1881. Well documented, though, by R.E. Hall, "Al-Khazini", in the Dictionary of Scientific Biography; vol. VII, 1973: 335-51. J. Samso: Al Khazini; op cit; p. 135. G. Sarton: Introduction; vol. 2; p. 122. Al-Khazini: Kitab Mizan al-Hikma, Hyderabad; partial English translation by N. Khanikoff (1860); `Analysis and extracts of Kitab mizan al-Hikma (book of balance of Wisdom), an Arabic work on the water balances, written by al-Khazini in the twelfth century,' Journal of the American Oriental Society 6:1-128; also Russian translation: by M.M. Rozhanskaya and I.S. Levinova `Al-Khazini. Kniga vesov midrosti,' Nauchnoye nasledstvo, Moscow, vol 6, 1983; pp 15-140. See also R.E. Hall, Dictionary of Scientific Bibliography VII, 1973: 335-51. N.Khanikoff ed. p.16; in R.E. Hall: Al-Khazini; Dictionary of Scientific Biography, VII, 1973: pp. 335-51. Al-Khazini: Kitab Mizan al-Hikma, Hyderabad; partial English translation by N. Khanikoff (1859); op cit. D.R. Hill: Islamic Science and Engineering; Edinburgh University Press; 1993, p. 61. A. Mieli: La Science Arabe et son rôle dans l'évolution mondiale, Leiden, E, J. Brill, 1966, p. 101. D.R. Hill: Islamic science; op cit; 61. R.E. Hall: Al-Khazini: Dictionary, op cit. For details, see R.E. Hall: Al-Khazini. D.R. Hill: Islamic, op cit., p. 69. R.E. Hall: Al-Khazini; Dictionary, op cit. Kitab Mizan al-Hikma, English translation, p. 24, in M. Rozhanskaya: Statics, op cit., pp. 621-2. Max Meyerhof: Science and Medicine, in The Legacy of Islam; edited by Sir T Arnold, and A. Guillaume; Oxford University Press; 1931; p. 342. B. Spuler: History of the Mongols; London, Routledge & Kegan Paul, 1972, p. 31. Ibn Battuta: Voyages d'Ibn Battuta, Arabic text accompanied by French translation by C. Defremery and B.R. Sanguinetti, preface and notes by Vincent Monteil, I-IV, Paris, 1968, reprint of the 1854 ed; Ibn Battuta: Travels in Asia and Africa; tr., and selected by H.A.R. Gibb; George Routledge and Sons Ltd; London, 1929. W. Durant: The Age of Faith, op cit. ; Chapter XIV; p. 339. N. Smith: A History of Dams, Chaucer Press, London, 1971; p. 86. G. Le Strange: The Lands; op cit. ; p. 402. Ibn al-Athir: Kitab al-Kamil; ed K.J. Tornberg; 12 vols; Leiden; 1851-72; vol 12; pp. 233-34. G. Le Strange: The Lands; op cit; p. 402. C. E. Bosworth: Merv; op cit; p. 621. J.J. Saunders: The History of the Mongol Conquests; Routlege & Kegan Paul; London; 1971. p. 56. J. W. G. Wiet et al: History of Mankind; op cit; p. 218.